Evanston students act in play at Evanston Township High School. The play examined race and identity in Evanston. City employees attended an original play that examined race and identity as a part of their equity and empowerment training Monday night. 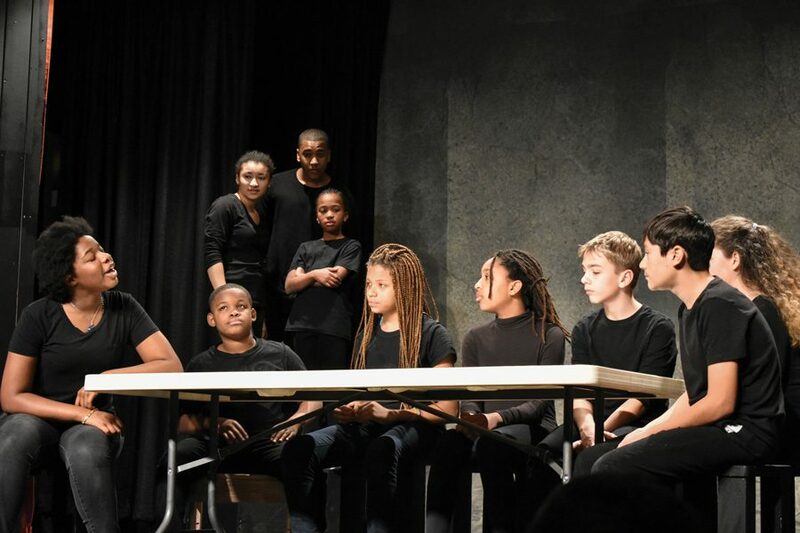 The play, “I.D.,” brought together Evanston children to act in scenes depicting the racial realities of Evanston. Mayor Steve Hagerty said the play is important because it speaks about the complexities of race and identity and can mobilize an important conversation. After the show, the directors and performers hosted a talkback to discuss the play and their experiences making it. The play began with the actors, aged between 10- and 15-years-old, being labelled with stereotypes based on their physical appearances. By the end of the play, the narrative is reversed to allow children to identify themselves how they choose. The show, written and directed by Dru Smith and William Eason, remounted Friday at Evanston Township High School. Originally premiered in November last year, the play was brought back in honor of Black History Month after its sold-out shows made clear the community was ready to start these conversations, Eason said. He added that Hagerty pushed for the play to return. “This production can do so much for our community in opening up the conversations that we need to have around race here,” Hagerty said during the discussion after the play. The play showed vignettes of the young actors discussing and grappling with modern race-related issues such as mass incarceration, protests during the national anthem and the controversy surrounding Confederate statues. In one scene, a young black boy was arrested for being out after curfew while his white friend ran away, forcing him to confront how his skin color makes him vulnerable to racial profiling. Eason said the play is meant to make people feel more comfortable talking about race. He added that the play is not only meant to challenge youth, but adults as well. Eason added that many of the vignettes were inspired by the children’s own experiences. One boy said after the play that he felt connected to a scene depicting negative reactions to an interracial relationship because his mom is white and his dad is black. Another actress who is black described a time when she was walking her dog on the sidewalk when a woman saw her from inside her car and locked her car door. “People are like, ‘Oh, that would never happen. This is Evanston, we are very liberal,’” she said after the play. “But it does (happen) and it needs to stop,” she said. Rev. Dr. Michael Nabors, president of the NAACP’s Evanston branch, challenged the audience after the play, and actors to continue the conversations the play evoked in their communities. He urged the audience to not return to their comfort zones.